I knew nothing of her story at the time, but while on vacation in Colorado God kept giving me a vision of praying over a home. I didn’t know whose home it was, but I could see myself anointing my hands with oil and praying. As the friend I was staying with sat down with me to catch up on life, she shared the story of this mom and said, “She really needs her son to receive healing! I want you to pray over her home.” Ah, confirmation of my vision! A few friends and I visited this woman’s house, ready to pray over her son and home, believing for a miracle. The small blonde boy, four years old, curled up in his mother’s lap as we laid hands on both of them. My husband, Joey, placed his hands on the boy’s knees as his prayed for the pain to leave and God to heal him. Another friend continued declaring healing in Jesus’ name, his hands on the boy’s knees as well. We finished by praying over the home and blessed the family, leaving full of God’s love. What I heard from Joey and my friend afterwards left me speechless. As the boy sat in his mother’s lap while we prayed (staying completely motionless), my husband and his friend could feel each knee begin to snap and move, the tendons shifting and adjusting as the words they prayed manifested in healing right before their eyes. God healed him the moment we prayed! Praise God! Yet today I stood in my amnesia, asking all those questions of “Where are you, God? !” forgetting all too quickly what He did right before my eyes just days earlier! Don’t let your faith stand on your memory. Make your memory stand on your faith. Don’t let your faith stand on your memory. Make your memory stand on your faith. Oh WHY must we be a people intent on short-term memory loss? We aren’t the first- the Israelites, King David, Job- they all looked at their dire circumstances and began to accuse God of being M.I.A.! Never mind Israelites, that He parted the Red Sea for you to escape Pharaoh. And plucked you, David, out of a field to make you King. Oh- and how He blessed Job extensively before AND after the tragedies he faced. He never left those people, and He never leaves us. 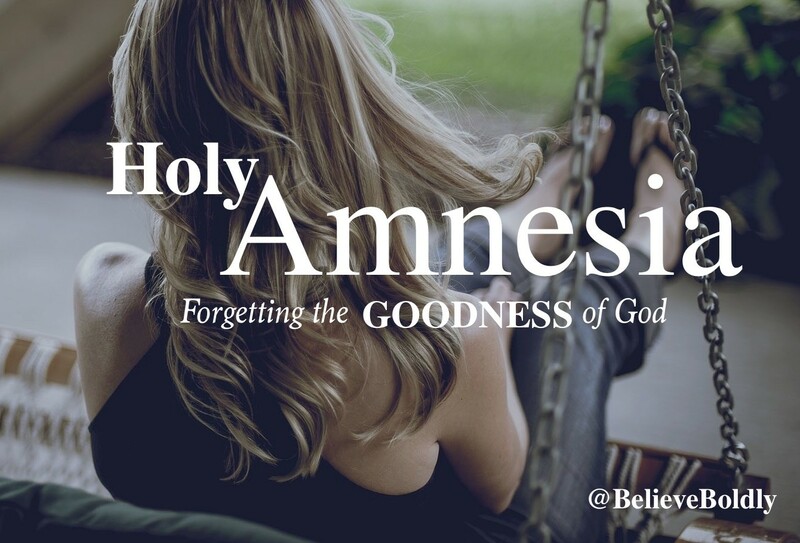 Do you find yourself facing holy amnesia, too? I know I am not alone. How quickly we forget the movement of God and begin to question if He loves us at all. We forget the goodness of God when we focus our eyes on our position instead of His provision. God doesn’t condemn me for my forgetfulness. Being the loving Father that He is, He scoops me up reminds me of all the love I really do receive! How He has healed and provided. How His love comes in many forms and the feeling of His love may not always be His primary method. Our food, shelter, family, job, church- they are all evidence of His love. Love, love, love this so very much!!! Hearing warrior has been so present the past 2 days! So very powerful!!! God is So So Good!!! This just what I needed this morning. Thank you so much! I love how God can orchestrate all things for JUST when we need them! Glad it spoke to you! Love hearing stories of healing in today’s times. And it is helpful. I know God is our healer but to hear or see him at work is fantabulous. I stand in the gap for a friend for her healing and this just gives more confidence when I felt like giving up. KEEP standing in the gap! Our timing isn’t always the same as God’s timing. He IS working! This was a perfect message for me this morning. I had these exact same thoughts as we traveled yesterday. God has done great things recently in our lives and I don’t want to forget that as more life events happen. Thank you for sharing. Always a good reminder of the powerful healing power of God! So glad to come upon this story! Thank you so much for sharing how God healed this little boy & is working for good in this families lives! So many times I let my faith stand on my memory & Iwant my memory to stand on my faith! I can remember the time when we lived in Idaho that my son was having an appendicitis attack, so I ran him to the ER and a friend of mine from church was there working in the ER. My son is afraid of needles, but she came in to comfort him while they put the needle in his arm to get fluids going. The doctor came in and confirmed that they would have to transport him to the main hospital in Boise and prep him for surgery. I immediately felt his tension, so I asked my friend to pray with me over my son before we left. When we got to the hospital and I met my son in the pre-op room, the doctor had come to me saying that he told her he was feeling better & that she had not seen this happen before. She was talking on the phone with the other doctor from Meridian and neither one could figure it out because he had all the signs of having an attack. I looked at her and said God answered our prayers! My son gave me a big hug and just smiled, he knew God heard our prayer and had answered it at that time! God always answers our prayers, it’s not always at that time or what we may think it should be, but when He shows us in that moment it is truly breathtaking! Thank you for sharing that! What a powerful story!